(Newser) – Always check your shirt and pants pockets before you throw your clothes in the wash, or even before you hang them back up in your closet, especially if you've recently purchased a lottery ticket. 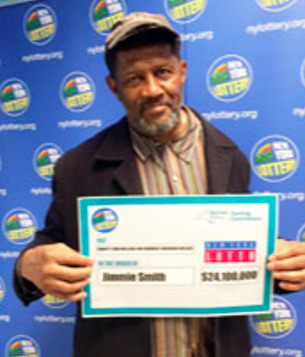 Jimmie Smith found that out this spring when he was watching the evening news in his East Orange, NJ, home and saw a segment in which New York Lottery officials announced they were seeking the winner of a $24.1 million jackpot, with a winning ticket set to soon expire, NJ.com reports. And so the 68-year-old retired security guard sauntered over to his closet, where one of his favorite shirts was hanging, a bunch of old lottery tickets crumpled up and crammed into the shirt pocket. Collect over 26 years, smart move. I've never remotely hit the jackpot, I once won $500 on a scratch off game and shrieked like I won Powerball.......my wife once thought she won $20,000 but didn't fully scratch the number off and thought an 8 was a 3. It was super fun and neat. I would NEVER take the payout in annuities. Always take the lump sum, even if it means taking less on the front. Anything from a gaming commission of any sort should be immediately cashed in. Whose to say the lottery won't go belly up from mismanagement or be banned by some kooky fundamental Christian leader in the future and all payouts aren't honored? The phrase they put on slot machines says, "Malfunction voids all pays and plays" and I don't trust a lotto commission to be honorable.